Is Your Airline Seat Upgrade Worth the Price You Paid? When is an Airline Upgrade Worth the Splurge? Home > Airlines > When is an Airline Upgrade Worth the Splurge? 02 Oct When is an Airline Upgrade Worth the Splurge? Airline upgrade regulations and fees have become increasingly more complex over the years. With so many choices (economy plus, premium economy, business, or first class), its difficult to discern the actual value of your upgrade. General perks include extra legroom, more privacy, more comfortable seats, and priority boarding, in addition to roomier overhead bin space and more direct bathroom access. Read our helpful guide below for everything you need to know about airline upgrades in 2018. Certain routes on specific airlines offer an option known as the “bid-to-upgrade” option. 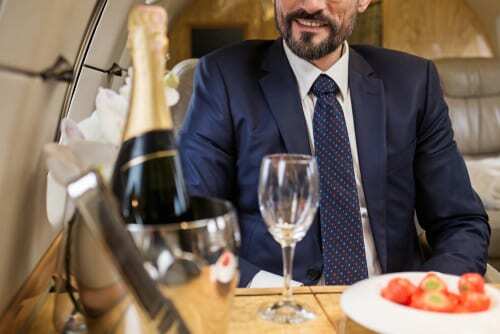 This allows ticket holders to decide how much they are willing to pay in order to move up one cabin class to premium economy or business class. This option is great because bidding often starts at a price that is just a fraction of the price you would normally pay for an airline upgrade to that seat. Check your airline’s website for exact rules & regulations on their bid-to-upgrade option. According to George Hobica, who founded the website AirfareWatchdog, one of the best ways to use the miles earned through credit card purchases is by purchasing an airline upgrade. He recommends spending your miles on a high-value seat or upgrade. Rather than a low-value ticket, a seat upgrade utilizes your miles’ value more effectively. However, Hobica also advises that you must be careful when purchasing an upgrade with miles because the airlines control the value of your miles and they can also change their own rules whenever and however they see fit. When is it Worth It? The answer to whether an upgrade is worth it is different for every person. The Points Guy asked TPG Lounge magazine readers for real life examples for why their upgrade was worth the splurge. In addition, what was it that convinced them it was worth it? Of course the most popular responses mentioned that the length of the trip made their upgrade price worth it. For example, for a 20 hour flight from New York to New Zealand, one reader said it was 100% worth it. Another reader purchased a United Airlines Econ+ seat on a flight from LAX to Hawaii – also worth it, in their opinion. Still not sure whether you should splurge for a seat upgrade on your next flight? According to Travel + Leisure, there is a way to calculate your upgrade’s worth. Divide total costs including your upgrade by the number of hours you will spend in the air. Is this hourly rate worth it to you? Also keep in mind that you are able to upgrade your seat on just 1 leg of a round trip flight. This is subjective, but if you want some extra sleep for a vacation, consider upgrading just your departure and flying back economy on the return. Contrarily, if you expect to be physically exhausted after a trip, upgrade your return leg. Ultimately, a specific upgrade’s worth lies in the eye of the beholder. If it’s worth it to you, then do it! Call us today to book your next getaway at 402-281-3022.